First solo lesson- Phys. Ed. Silence, a form of activism? They say “silence is golden” but is it always. In certain situations silence is a good thing but when it comes to online social activism it may not be. Katia Hildebrandt talks about this in her blog post In online spaces, silence speaks as loudly as words. As always what Katia had to say has given me some food for thought. I do not consider myself much of a social activist online or in the real world. 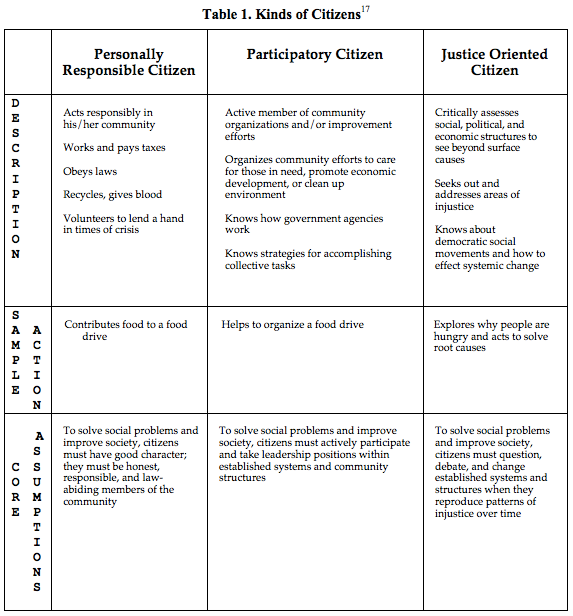 When I came across this chart that describes the different types of citizens I definitely fall into the personally responsible citizen. I donate food, toys, sign petitions etc as I feel inclined to or money allows but rarely do more than that. When it comes to online activism I will share the occasional post about something I believe in but I often weigh how offensive it is to someone who might see that. Since I have decided to come back to University and attempt to enter the Faculty of Education, I found that I have been even more cautious about what I share, like and comment on in regards to social justice issues. Most of the time erring to stay silent. Like Katia points out in the Online spaces blog post, many of her students tell her that they are fearful of the possible consequences for future jobs if they post controversial things. They opt to stay neutral as possible. I am one of those people and I am fully aware that there is no neutral. Still I really cut down my sharing of things that I thought could cause me potential placings, jobs in the future. I chose to stay silent on the things I supported and didn’t support out of fear. Even though fear was/is the biggest motivating factor in my silent activism, I also try not to engage because I often feel that it is difficult to get a point across in the written word. I don’t feel that I can write well enough to argue a point effectively. Also with the written word the tone is often misinterpreted or meaning twisted and you end up arguing about how you said something or what you meant. In that way I don’t think discussions are very effective and often the lead to personal attacks on character which I don’t agree with. As I write this I came to the realization that I don’t stand up against those personal attacks either. That very thing happened to me today. I realize my silence on the matter means that A) I agree with everything in the post or B) I didn’t see the post. I saw the post. So as I sit here and try to finish this post, I feel sick about my inaction as the realization about what my silent activism says. In this particular case, I agree with the poster about the event but I do not support the resulting comments about the character of the people involved in the event. I know what I should do am I brave enough to do it. Am I willing to risk some of my privilege. Next > Not having fun yet. Pam, I agree it is hard to express how we feel in an honest way when surrounded by other views, perhaps, not in agreement with your own. Thanks Tanya @tmweller. I am taking ECS 100 with Julie in the fall. Any insight to the class you would like to share? Week 2- I didn’t quit.